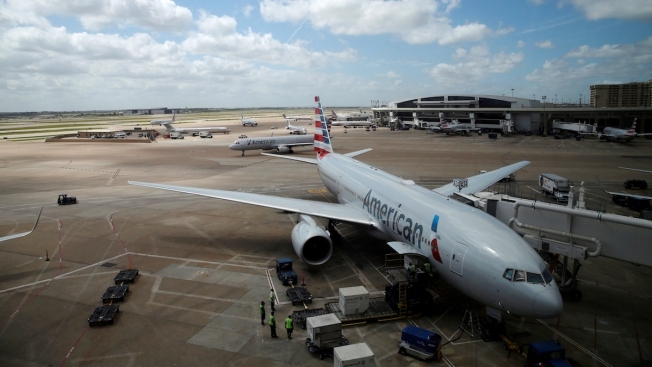 In this June 16, 2018 file photo, American Airlines aircrafts are seen at Dallas-Fort Worth International Airport in Grapevine, Texas. American Airlines, United Airlines and Frontier Airlines have asked the Trump administration not to put migrant children who have been separated from their parents on their flights. The 3 airlines said that the administration's recent immigration policy of separating migrant families conflicts with their values. "We have no desire to be associated with separating families, or worse, to profit from it," American Airlines CEO Doug Parker said in a statement. United issued a statement in which CEO Oscar Munoz said the company's purpose is to connect people. "This policy and its impact on thousands of children is in deep conflict with that mission and we want no part of it," he said. Southwest and Alaska also criticized the policy and asked not to be involved in transporting separated children. Shortly after, the Department of Homeland Security issued a statement in which spokesperson Tyler Houlton called the airlines' move "unfortunate." The DHS also added Frontier Airlines to the list of those that will not transport the children. Houlton said: "Buckling to a false media narrative only exacerbates the problems at our border and puts more children at risk from traffickers. We wish the airlines would instead choose to be part of the solution." Since the White House announced a "zero-tolerance" policy toward undocumented migrants in early May, more than 2,300 children have been taken from their parents at the U.S.-Mexico border, leading to a spike in the number of young children under government care. Many airlines have contracts to provide travel services to the U.S. government. Parker said, however, that the government doesn't provide information about the passengers or their reason for travel.